Nowadays SMI bombard people with a great variety of informational topics. More often than not these topics are unrelated to the field of their expertise. Thus, an average person has a great difficulty processing and classifying this informational flood. This also applies to light workers, generating a greater psychic misunderstanding. Erroneous associations exist in the area of occult – spiritual and psychic practices – consequently bringing psychic misunderstanding. In a collective public consciousness, those practices lumped together with witchcraft – voodoo – poltergeist – vampires and similar dark magic personnel. Such generalizations come from books, movies, and TV shows. Authors that write for those shows are not experts in the psychic field. However, you cannot put the blame entirely on those authors. The public would not be interested to read about real life problems like anxiety, panic attacks, depression, and claustrophobia. People experience these problems because they are lonely and do something they have no passion for. They are engrossed in mundane work, are starved for attention, compassion, love and affections. An author has to come up with a certain template where there are good guys fighting for freedom or other noble cause. They make their way through the obstacles instigated by bad guys. Depending on the genre, the nature of bad guys could vary from gangsters, serial killers and pedophiles to evil aliens, spies, terrorists, vampires, witches and evil spirits. A psychic in such novels wouldn’t be engaged in such mundane activities as traveling into someone’s aura and fixing the energy imbalance. Rather, if she is a psychic of “good”, she’d fight alongside the “ghost busters” challenging evils spirits, witches, and other spiritual none-life; those that attempt to sabotage the life of honest citizens. 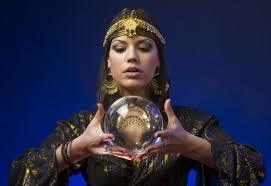 Those “good: psychics would predict the “right” behavior to the protagonists and change the future of the humanity. A true psychic counselor can help with empathy and understanding, she or he will offer guidance with visionary insights to facilitate the better outcome. However, in order to change your life, you need to work on yourself. Psychic or not can only help people who want to help themselves.